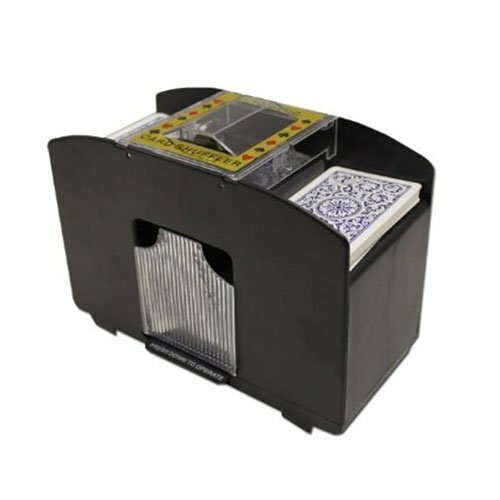 Whether you are playing simple card games like Uno, or want to bring the casino feel to your next poker night, this four-deck automatic card shuffler is the perfect solution. Our shuffler is ideal for assisting children who have trouble shuffling cards. It's also great for those with arthritis, or people with limited dexterity who find shuffling to be difficult or painful. An automatic card shuffler is a fantastic way to increase game efficiency and speed up playing time. This four deck shuffler makes a perfect gift idea for any card game enthusiast. Easy to use, this shuffler can be operated at the push of a button. Each item shuffles up to four decks of standard playing cards, including KEM and Copag.